Space scientists just added two more worlds to the Habitable Exoplanets Catalog—the online database ranking the best picks for life in the galaxy. 55 planets now make the list—all places where extraterrestrials may exist. Or perhaps not; maybe nothing lives on any of them, not even a microbe. “There are still so many unknowns,” says Abel Mendez, the catalog’s chief curator. The two new planets, like their 53 predecessors, are little more than shadows to us, literally and figuratively—cosmic conundrums residing trillions of miles from our solar system. But this much is known: Both worlds are near the size of Earth. Both might have Earth-like temperatures. Both orbit their stars in the habitable zone—the sweet spot in a system, a location where liquid water may flow and life may flourish. Mendez, a planetary astrobiologist and professor at the University of Puerto Rico at Arecibo, says that’s enough to consider them “potentially habitable,” at least for now. Kepler-1652b is new to the Habitable Exoplanets Catalog. 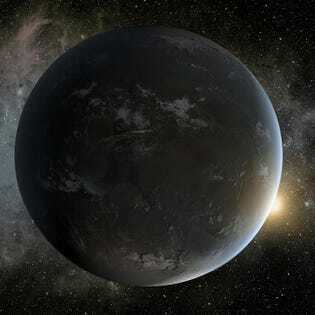 Kepler-1652b—probably rocky, and “only ten percent larger than Earth,” says Mendez—orbits a red dwarf star in the constellation Cygnus, 822 light years away. Red dwarfs aren’t easy parent stars. Many are hyperactive; some blitz nearby planets with ferocious stellar flares, annihilating their atmospheres. Indeed, preliminary data indicates reasonable surface temperatures—around 40 degrees Fahrenheit. In New York City, that’s a mild winter’s day. And that’s also the rub. Artist’s impression of a red dwarf star. Kepler-1652b is so far away—about five quadrillion miles—there’s little more to do than speculate and estimate. The world is too remote for even NASA’s James Webb Space Telescope, now slated for a 2021 launch. The other planet—HD 283869b—orbits a “K star” in the constellation Taurus, 155 light years away, approximately 900 trillion miles. K-stars—so-called “orange dwarfs”—are larger than reds, but smaller than our Sun. More additions to the catalog are expected before year’s end. Ultimately, Mendez anticipates a list of thousands. Artist’s concept. An exoplanet with life.